Kiara Jordan is a sophisticated modernista, but beneath an engaging personality and super-model looks, her heart hungers, and she longs for deeper meaning in her life. Ken Lucerne is the charismatic young pastor of Woodland Church; he's adjusting to life as a widower and copes by keeping as busy as possible with his parish and missionary work. A home-building mission in Pennsylvania brings them together, and forces them to look hard and deep at the relationship they share, and where God means for it to go. Already bound by mutual respect and caring, love dawns, a love that takes them to a life-point neither would have expected. After all, can a chic, vivacious woman find fulfillment within the quiet, mission-centered life of a clergyman? 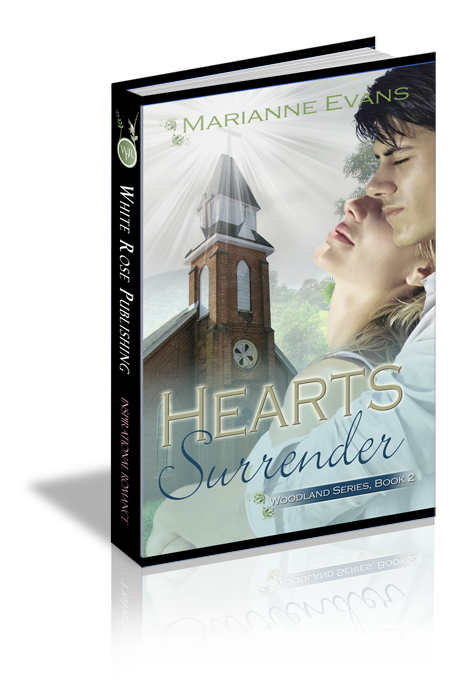 Can they trust God's hand strongly enough to surrender their hearts to one another...forever? In an unexpected, graceful motion, Ken caught her swing by the chains. He held her in place, suspended backward, with nothing but a cushion of air between them. All at once Kiara went dizzy and hyper-focused, tempted once more by that full, supple mouth, and the satiny-looking fall of his thick brown hair as he leaned over her. He was close enough to touch. In this moment, she wanted nothing more than to do just that. “All present evidence to the contrary.” He set her gliding once again and Kiara’s stomach performed a sparkling fall-away. She delighted in his words but forced herself to brush them aside before they could take root and sway her into believing he saw richness to her spirit. After all, it was part of Ken’s persona to be gracious and encouraging. At the start of Hearts Surrender, Kiara does battle with temptation. She's been offered a deluxe trip to Europe that might fulfil a seductive fantasy with her boyfriend, but sell-out her soul. When have you been confronted by a temptation, or a life circumstance, that required doing battle with the good and bad elements of your life, and faith walk? How did you resolve it? Q2. Emotionally speaking, Ken Lucerne is a man on the run. He copes with the loss of his wife, Barb, by keeping as busy as possible, both as Pastor of Woodland Church, and in mission work that carries him across the country. How does Kiara's evolving presence in his life force him to revaluate that pattern of living? A2. He comes to realize he can, and will, fall in love again. He learns that while his wife's life ended, his didn't. And, not only does he have a God-given mission to perform, but a heart, and love, to share as well. Q3. In what ways does the Woodland Church mission to Pennsylvania force Kiara away from her comfort zone? How does she adapt? Describe and discuss a situation when you had to leave the familiar behind and embrace something completely new and foreign. How did it feel? How did you overcome? What did you learn? A3. Kiara wants to help, but has never performed mission work before. She doesn't know what to expect when the team helps restore the Kidwell's home. At the start of the mission, this fact sets her on edge, but her natural effervescence, her genuine desire to make a difference, endear her to the teen volunteers, the Kidwells, and most especially Ken. She realizes that giving back isn't nearly as overwhelming as she feared it would be. Q4. As their relationship develops, Ken and Kiara quickly realize they'll need to contend with people at Woodland Church speculating about them, and the changes the mission trip has brought about between them. Discuss the topic of gossip, and well-meaning intrusivness in your own Church's setting, and in your own life. What are the ramifications? Q5. Kiara is described as 'supermodel chic' but we learn she is actually the wall-flower who bloomed. She has self-esteem issues that would surprise most people who see and meet her because she has very carefully crafted herself, both physically and emotionally, to gain acceptance from the world at large. Have you gone about life or physical change in order to gain acceptance? In what way? How has it affected you over the long term? Q6. Ken doubts his ability to fulfill Kiara's life, which he considers to be painted in bold colors, with excitement and modern, more culture-driven influences. In what way does he discover how far from the truth, and trust in God, that doubt places him? How have you handled connections God weaves into your life that are powerful, and positive, despite what may seem to be a combination of 'oil and water' at first? A6. Collin Edwards forces him to confront the fact that during the mission trip, Ken became more 'man' than 'pastor' to Kiara, and that Kiara, meanwhile, became far more than a realistic, spirited member of his parish than fashion model beautiful woman. Ken realizes he can't let Kiara's spiritual growth, and their opportunity to be together, be stymied by his inability to practice what he preaches: Faith, and trust in God's plan and guiding hand. Q7. What elements of the conclusion of Hearts Crossing reveal the truth that when we let go of preconceptions, and reach out in faith, not only does God answer our call, He exceeds our greatest hopes and dreams? When and how have you experienced the abundance of God's grace and mercy? How did you thank Him? A7. Kiara and Ken's Caribbean honeymoon is not just meant to be a 'happily ever after.' It's meant to illustrate the fact that God knows best. Reaching out in faith, Kiara attains the idyllic 'fantasy trip' with the man of her dreams, Ken Lucerne. Ken never dreams of moments like this after Barb's death. By God's grace, they both find a true, and anointed happiness.